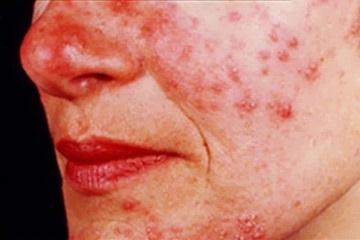 Sometimes rosacea appears in people with autoimmune conditions like Rheumatoid Arthritis, Diabetes type 1, multiple sclerosis, Crohn’s, ulcerative colitis and celiac disease, and is sometimes considered an auto-immune condition. However, the ‘cause’ which makes the most sense to me, and where I’ve seen the best results – is in treating the gut and using supplements. Dysbiosis and gastrointestinal disorders in people lead to increased prevalence of the problem, and almost everyone I’ve ever seen with rosacea has leaky gut. Once this is addressed, the problem can be very efficiently controlled with a few basic nutrients. Zinc is a skin-specific nutrient and also encourages stomach acid production, and regulates insulin production. It is a fundamental nutrient in cell-mediated immunity and is an anti-inflammatory. Bio-Curcumin, the active ingredient in turmeric – is a powerful anti-inflammatory for skin and for the entire body, especially if you have other auto-immune problems such as a Rheumatoid Arthritis. All the above are available from my online store at here. Read The Low-Carb Creed (also in the store) for a good healthy diet to follow, food lists, and the rationale behind an anti-inflammatory diet.